A Shopping Blog, featuring shopping tips, the latest trends and shopping of Apparels to Appliances, Confectioneries to Cosmetics and Books to Electronic Gadgets on a budget. www.rightshopping.in is now officially closed. Right Shopping Pvt. Ltd. will continue its business through its other websites. Moto's partnership with Google (and use of the 3.0 version of its mobile operating system, Honeycomb), has made that assumed inevitability a very serious reality. There can be little question that the Xoom is certainly a contender for the hearts and minds of potential tablet buyers in the market, and RightShopping.in is really proud to flash that for you. Motorola Xoom has an ultra fast dual-core processor and Android 3.0 Honeycomb- the powerful Google software designed specifically for tablets. Xoom features front and rear facing cameras, an HD video camera and the latest apps all on a 10.1 inch widescreen display. Specifically optimized for devices with larger screen sizes such as tablets, the Android 3.0 platform (dubbed Honeycomb) introduces a brand new, truly virtual and "holographic" UI design. With five customisable home screens, you can easily access your favorite live widgets or application shortcuts. Each screen features a familiar launcher to access to all installed applications, as well as a Search box for universal search of apps, contacts, media files, web content, and more. Multitasking in Android 3.0 is easier than ever, and you can use the Recent Apps list in the System Bar to see the tasks underway and quickly jump from one application context to another. You'll even see a snapshot of the last screen viewed in that app as a visual reminder. The Android onscreen keyboard has also been redesigned to make entering text fast and accurate on larger screen sizes. The 1GHz, NVIDIA Tegra 2-based slate boasts a sizable 1GB of DDR2 RAM, 32GB of internal storage, a 10.1-inch, 1280 x 800 capacitive display, 3G connectivity (Verizon on our review unit), along with front and rear facing cameras, HD video capability, and loads of wireless options. Not only is the Xoom clearly competitive (and frankly, more stacked) than most of its competition, Motorola has attempted to futureproof the device by offering a free hardware upgrade down the road which will give the tablet access to Big Red's 4G LTE network.The Motorola Xoom has a wide range of optional accessories to expand its power and capabilities. The "smart docks" are no longer just a place to charge your device; they make Motorola Xoom a portable play and work station that fits your lifestyle. The Standard Dock can be used for watching video content or listening to music through external speakers as the device charges. The Speaker HD Dock allows you to send HD content directly to your TV or blast your tunes without attaching external speakers. Be there at www.rightshopping.in/g/p_d.asp?pid=GD100009626&item=Motorola%20Xoom%20%28WiFi%20+%203G%29%20Tablet%20PC to get it now. It’s fun to be here while shopping, and of course, a great time for your pocket. Forget all those tiring visits to the markets, those nagging salespersons, those long hours of finding your most sought after products. It’s the shopping carnival that you’ll be getting here instead, and you have the leisure to sit back at home, relax and enjoy seeing your ordered items are instantly delivered. The link at www.rightshopping.in is the address for you to visit. In a market where online shopping is still considered to be an unsafe and unreliable option, the shopping at www.RightShopping.in assures its customers by providing the safe and secured payment gateway. To make the shopping experience available smooth and lesser time consuming, the easy to browse and easy order placement definitely has acted in its favour. 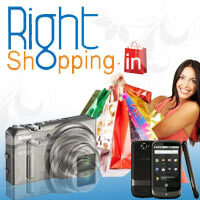 RightShopping.in is truly a one stop shop for all shopping needs.